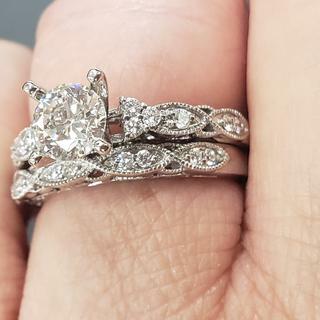 Twenty-two round pavé set diamonds at approximately .24 carat total weight, shimmer and shine in this vintage inspired wedding set. Crafted from quality 14 karat white gold, these stunning rings will highlight the center stone of your choice beautifully. I am in love with this ring! I looked at a million rings before I found this one & I am so happy I went to Shane Co. 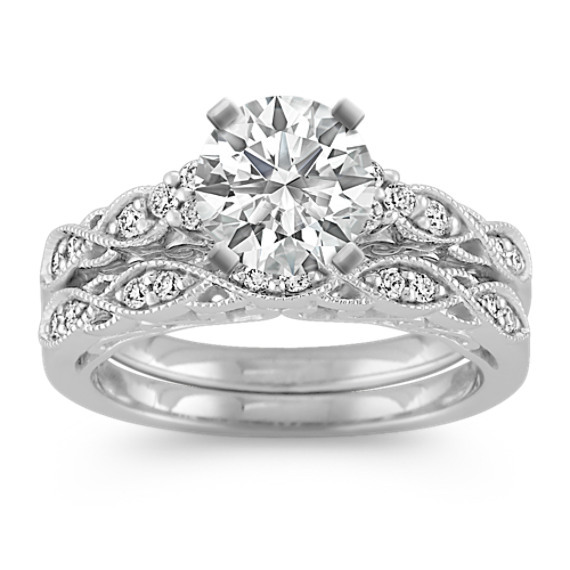 This ring is timeless & beyond beautiful. I know I am going to be happy with this ring for the next 25+ years. Shane Co. was absolutely amazing to work with & the warranty/guarantee you get with them is fantastic. Quit looking - you found the ONE! New set for 1 Year Anniversary, LOVE THIS RING! After months of having this ring in my cart, my husband and I finally went in the store to see it in person and it was perfect! We placed the order for sizing and placement and picked it up two days later! The detail makes the ring look like a princess ring and reminds me of Cinderella! This is one carat white sapphire. We couldn’t be happier with Shane company and I know that if something happens to the ring or I need an adjustment they will get it done for me. Always great customer service and quality!! My husband bought this set for me and I absolutely love it. He chose a sapphire for the stone and it looks perfect, I'm not a diamond sort of gal. My hands are pretty small, ring size 5-5.5 and it is the perfect size for my fingers without being bulky. The details are lovely and I get lots of compliments from strangers! The band alone also looks great; simple and beautiful.